I found a magenta foil envelope in my mailbox this past Saturday-- yay! Another cute bag this month-- a black textured vinyl bag-- filled with some 4 full-sized products and 2 fragrance samples. 1. English Laundry Signature Fragrances: 2 deluxe fragrance samples-- one Pour Femme and one Pour Homme. I liked the men's version but the women's is a bit sweet for my taste, but I think I'll wear it. 2. Nicka K New York Nail Color in Ripe Apple: This is a gorgeous creamy blue-based red and it's 3 free. 3. POP Beauty Brighten Up Your Life Eye Shadow Trio in Smokin' Hot: these shadows have a dry, chalky texture with mediocre color payoff. Not my faves. Might be okay over a sticky base. 4. NYX Extra Creamy Round Lipstick in Sky Pink: his is a light frosty pink with a sheer texture. A little to sixties mod for me, though the texture is light and creamy. Wish I received this product in a different color. Maybe I could make this work with a gray smoky eye if I sheer it out. 5. Be a Bombshell The One Stick in Flustered: this multi-tasking eye, lips or cheeks has a cream to powder texture reminiscent to that of the Nars Multiples. Flustered is a bright pinkish-cherry red with some glitter. Give a nice been-out-in-the cold-rosy look to the cheeks and lips. Not sure that I'd put this on my eyes. 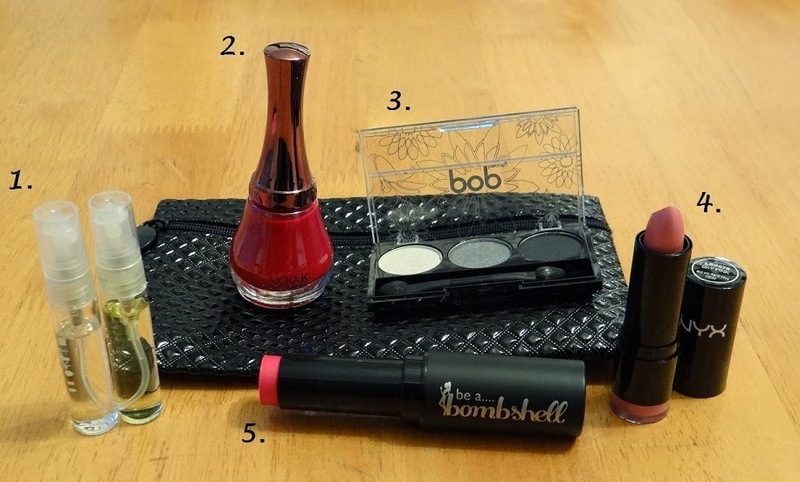 Other then the POP Beauty eye shadows, I like all of the products in this month's Ipsy Glam Bag including the makeup bag that the products came in. All in all, I'm happy with this bag.